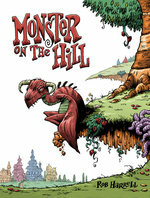 Rob Harrell is not a monster, but he does live on a hill. Born and raised in Bloomington, Indiana, he created, wrote, and drew the daily comic strip Big Top, which was syndicated internationally from 2002-2007 and collected into a book by Andrews McMeel. Currently he draws the popular strip Adam@Home, appearing in over 140 papers worldwide. His paintings have been mounted at galleries across the country, and his illustration clients include Mad Magazine, Simon & Schuster, American Greetings, Time Inc., and Volkswagen. He lives in Austin, Texas with his wife and their dogs. Visit him online at www.robharrell.com. 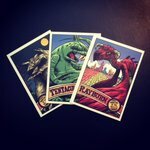 Also available for MONSTER ON THE HILL FANS, Rob Harrell has prepared a limited run of Trading Cards featuring RAYBURN, TENTACULOR, and THE MURK. They're cool!